Operations Manager, Overseeing All Aspects of the Manufacturing and Installation of All of Our Fine Products. I grew up in Oklahoma, the son of a career Air Force flight engineer and a hard-working, socially active mother of 8. I found my passion early while in high school, working with wood. I spent a lot of my junior high and high school time in shop and carpentry classes. Luckily, my school system was blessed with a great vocational carpentry class that gave me 3 hours a day training for 3 years. The class covered all aspects of carpentry and leadership training. I excelled in this program and became President of our VICA organization when I was a junior in high school. By the time I graduated high school, I had participated in the building of two houses and was the superintendent in charge of building a two story church. After graduating, I moved to Florida and worked as a carpenter for several years. I then met my beautiful wife and have raised two wonderful sons. I spend my personal time enjoying my family, fishing with my father, playing golf, and watching sports. I occasionally enjoy going to a NASCAR race. One rainy season in the mid 80’s kept me from being able to work several days a week, so I got a job in a local custom cabinet shop. They placed me in the custom department, where I was able to lay out and build a lot of beautiful and interesting things. In 1995 when the cabinet shop sold and closed, I came to work at what was Marble Works, now Kitchen & Bath Center. I began my time here as a subcontract cabinet installer. I since have worked in and supervised several departments. 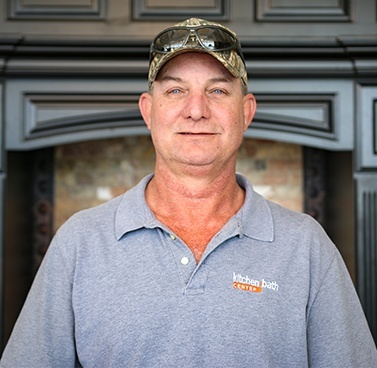 I currently serve as Production-Plant Manager, which assists and advises our Cabinet, Marble, Glass, and Granite Divisions along with scheduling Marble and Glass in Florida and Glass in Alabama.